This dish is actually just a cleverly put together one, It doesn’t need any exotic cooking skills. It’s pure management of resources, as I would like to put it. What you however do need is a sweet-spicy-herby jam to go with it. I had some left overs from my peach-cranberry-basil jam that was made last winter. I added a bit of my chilli jam (i usually make my own, but that recipes hasn’t made it to the blog as yet, but this is where my recipe came from) and a bit of my carrot and ginger jam to it. (i promise to post some jam recipes soon) and to bring out all the fresh flavours of the figs and jam and cheese I added some more freshly chopped basil to the jam. And kept some aside for garnishing. For crackers I used Ragi crackers from Baker’s Dozen but you could make your own multigrain crackers too. 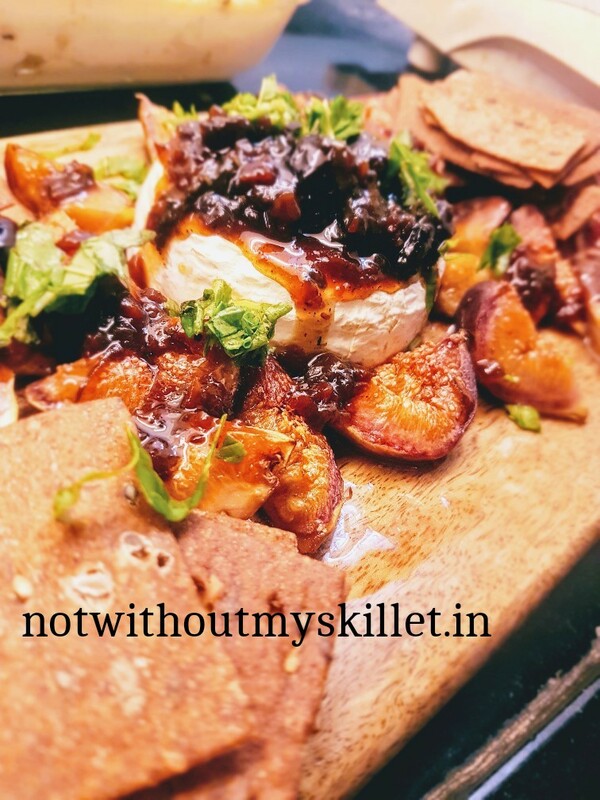 In India, figs are almost on their way out, in case you don’t get them you could try this recipe with fresh mangoes too, Mangoes and basil again a great pair. However don’t grill the mangoes! Or even some roasted watermelon rind, just the white part of the watermelon. Mix that up with the fleshly red interiors. Or grilled papaya! Yup that’s awesome too! 1. 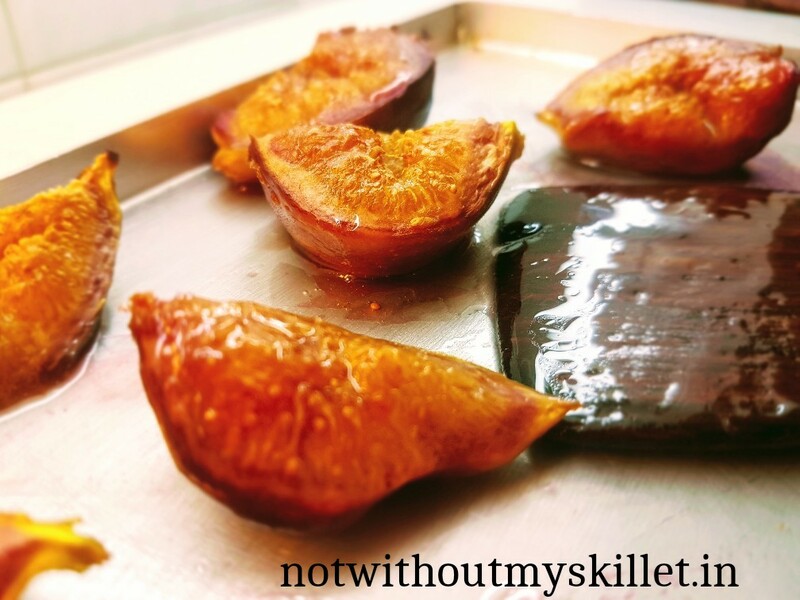 Cut the figs into quarters and pour some honey over it. Grill it for 10 minutes in a hot oven at 180 degree centigrade. 2. Unwrap the Brie and grill it besides the figs for 10-15 minutes, till the top is golden and bubbling. 3. Heat the jam and add a teaspoon full of freshly chopped basil. You could use my bacon jam too, and use rosemary or thyme instead of basil. Be generous with the helping of the jam! 4. In a serving dish, place the brie at the centre, place the grill figs around it. 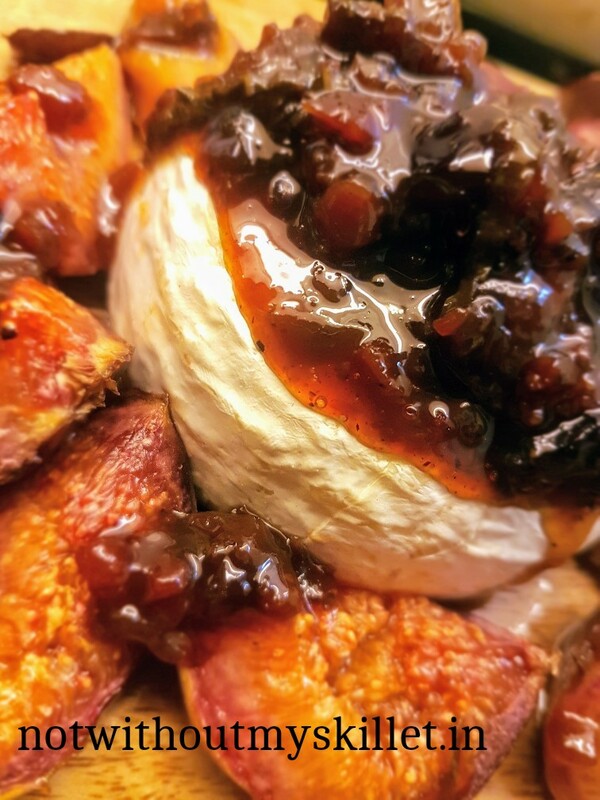 Top the Brie with the jam and pour some of it on the figs too. Place the crackers on the corners of the serving dish. Sprinkle some more freshly chopped basil on top of the cheese and serve hot! 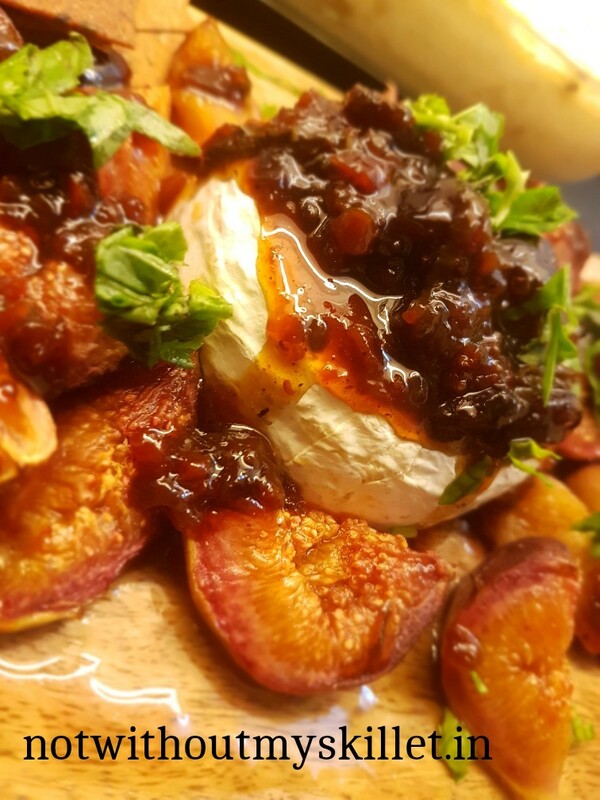 Grilled Brie with figs and a Preserve, needs to be a centre piece on you dining table! Sounds yummy. Will definitely try this one. What say you to adding some walnuts too?